The Isle a la Cache Preserve is part of the Forest Preserve District of Will County. This preserve is actually located on an island in the Des Plaines River in Romeoville, Illinois. The preserve offers many recreational and educational opportunities. One of the main attractions is the museum where guests may learn about the fur trade history of the region. Other attractions include the Centennial Trail to bike, hike, or walk on, a picnic grove, fishing, canoe/ kayak ports, geocaching, cross-country skiing, among other things. 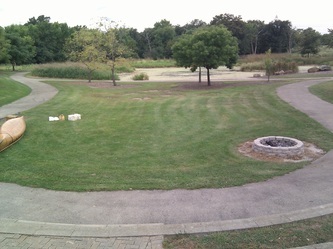 There are actually two separate areas in this preserve that are dedicated to outdoor classroom environments. 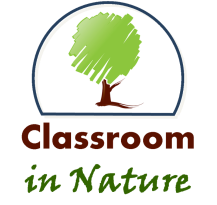 Above are pictures and below are descriptions of the main outdoor classroom environment found at the preserve. Image 1 shows a view from the top-right (participant perspective) of the seating stones, while Image 2 is from the top-left. Image 3 is taken from the perspective of the focal point of the outdoor classroom; this is where the teacher/instructor will primarily be giving his/her lesson or lead activity. Image 4 is a far view of the outdoor classroom, encompassing the large span of stones in which participants may sit, with grass between each row. 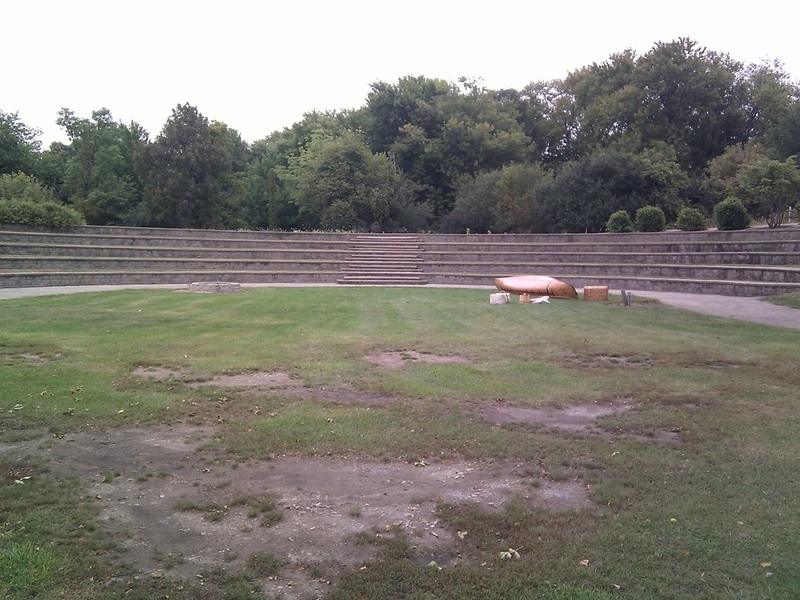 Finally, Image 5 is a view of a possible participant of the outdoor classroom; he or she would be sitting here, and this is the perspective that the participant would have. As evident from the pictures above, this outdoor classroom is very large, with the capability of holding between 150 – 200 people comfortably. There are five rows of stones in the shape of a semi-circle in which individuals may sit, not to mention the large grassy area where individuals could also sit or stand to watch a presentation taking place. 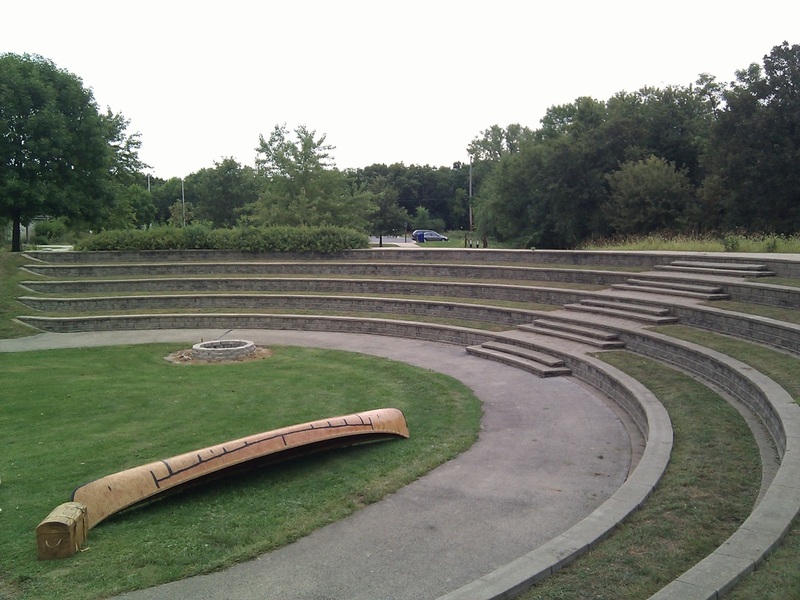 All of the seating is facing the center of the circle, on the ground, where the teacher or instructor would usually be standing and presenting. There are many different activities taking place at this forest preserve throughout the year. When I was there to take the pictures above, I noticed a canoe on the ground in the middle of the circle of stones. It seemed as if this canoe was/is used as a prop or instructional tool to tell the history of this specific forest preserve. 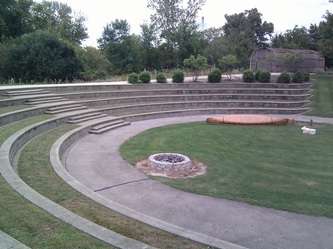 I also noticed a fire pit off to the side of the center of the circle. 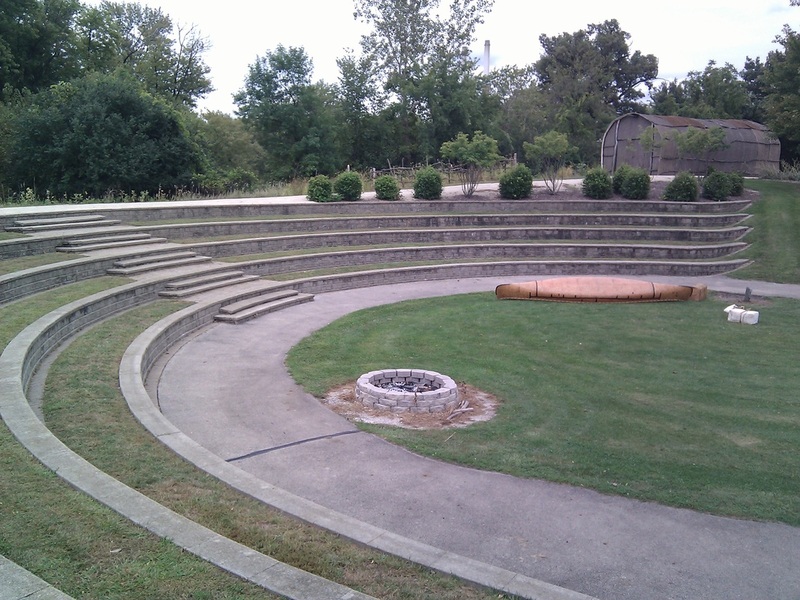 There was burnt wood in this fire pit, so I knew it must be used for forest preserve activities – such as story telling at night, for example. There was a secondary outdoor classroom found at this same preserve. 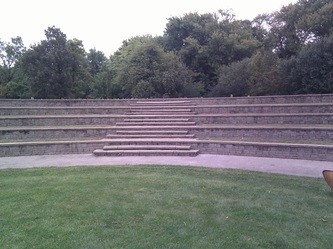 This outdoor classroom was much smaller and could incorporate maybe 30 participants. In Image 6 we see a semi-circle shape of seating stones. 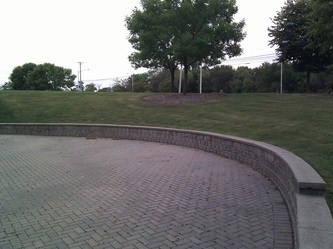 These all view upon the center area, which is covered with walking bricks. From past experiences with this forest preserve, I know this area is used for gathering of volunteers before, during, and after volunteer work days. This area acts as a holding zone for participants, as well as an instructional area where leaders can direct individuals to the tasks needing to be accomplished for the day.